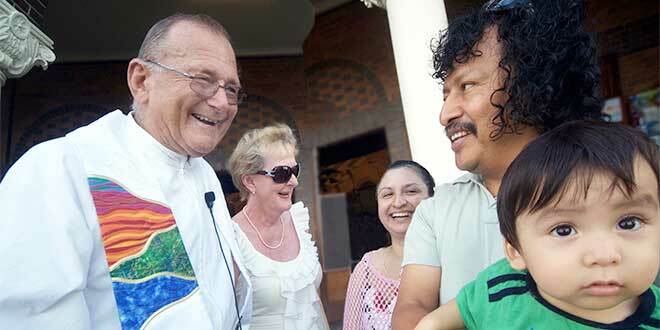 Much loved: The late Toowong parish priest Fr Peter Quin shares a laugh with parishioners. AFTER more than 100 years in the parish, the Jesuits will withdraw from St Ignatius, Toowong, at the end of this year. It’s a decision that has been greeted in the parish by shock, sadness, but also a sense of appreciation for the work of the Jesuits. The decision to leave was made by a Jesuit parishes task force set up more than 18 months ago to respond to the increasing difficulty of finding Jesuits to serve in nine parishes across the country. Led by the province delegate for parishes Loreto Sister Libby Rogerson, the task force was asked to discern and develop criteria for remaining in or withdrawing from a parish, and then to make recommendations for the Jesuits’ provincial and consult. Last weekend, Australian provincial Jesuit Father Brian McCoy visited Brisbane to announce the withdrawal, meeting first with the Jesuits, the parish council and a group from the parish. He then made a formal announcement at each of the Sunday Masses, in a homily, which noted his own connection with the community at a time when he was working among Torres Strait Islander people in Townsville. “In 1979, at the age of thirty-one and ordained less than two years, I was missioned to work in Queensland,” Fr McCoy said. “While living a long way north of Brisbane we formally belonged to this Toowong Jesuit community and would regularly visit the parish and community on our travels north or south. Fr McCoy paid tribute to the life and work of the long-standing parish priest Fr Peter Quin, who died late last year. He said the decision was not based on the sad reality of Fr Quin’s death, but on the reality that the province did not have enough men to serve as parish priests for all its parishes. Fr McCoy said he hoped the parish would continue to have strong connections to the Australian Jesuits. “One thing that we are committed to doing over the coming months – and confirmed on Friday night – is to see how Jesuit and Ignatian connections may continue and be further strengthened,” he said. Parish representatives read out a response to the announcement, noting that the news may not have been unexpected but that it was still difficult for many. “In this time of grief and shock it is important for us to remember all the blessings and gifts we have been given by the Jesuits over a century,” the statement read. “Ignatian spirituality is a precious gift that the Jesuits have shared with us during their time in Toowong, each priest in his own unique way. “While we mourn the loss of the Jesuits who have nourished and served us for over 100 years, we are now invited to personally embrace this heritage of Ignatian spirituality and to share it with one another and the wider community – to be an Ignatian light for the people of Brisbane. “We need to follow the example of Fr Peter Quin and the other pastors who have ministered to us so faithfully as we pick up the staff, look forward and make the best of the opportunities that this change, though painful, offers us.